Charlie Weber and others wear black high top Converse “Chuck Taylor” All Stars in the film. John Gacy was one of the worst serial killers we know about. Gacy is a character study of serial killer John Wayne Gacy, a man who tortured, raped, and then killed 32 men and boys over a period of six years in the 1970s, and buried them in the crawl space below his house or dumped their bodies in nearby rivers when the space below got too cramped. Unlike the made for television movie To Catch a Killer, which focuses on the police procedural side of this story, Gacy tries to present many of the events from Gacy’s point of view. The fact that John Gacy was able to get away with the crimes he committed for so long has a lot to do with his “Dr. Jekyll/Mr. Hyde” personality and the mores of the times, when people tended to be more trusting of “respected” figures in the community, and the victims of sexual crimes, especially if homosexual in nature, were often too ashamed to admit what happened. Unlike today where people are more aware of predatory behavior and there are national databases of child molesters, during the sixties and seventies when Gacy was active as a sexual predator, it was often possible to get away with these crimes because the victims would not press charges or show up in court. Even when convicted, as Gacy was when living in Iowa with his first wife and family, his ten year sentence for molesting a teenager was commuted to 18 months for good behavior. Divorced by his first wife, Gacy was free to move back to a suburb of Chicago and start over with a new wife and family. Gacy drags the body of one of his young victims to the crawl space under his house. Except for an opening flashback scene that shows a young Gacy with his abusive father, Gacy focuses on the final two years before the discovery of his crimes and his arrest. The year is 1976 and the setting is Des Plaines, Illinois, a suburb of Chicago, where John Wayne Gacy Mark Holton) lives with his second wife Kara (Joleen Lutz), two step daughters (Jessica and Grace Hanamoto), and his aging mother (Edith Jefferson). There isn’t so much a defined story line as there is a series of vignettes that show the many sides of his persona. We see Gacy with his family at Thanksgiving dinner where his wife and two daughters act uncomfortable and uncommunicative while his mother seems very accepting of everything. We see the dinner interrupted by a young disgruntled employee of Gacy who is angry because his paycheck is over a week late and how Gacy is able to fend him off. We see his neighbors complaining about the horrible stench that comes from the crawlspace under his house, demanding that he do something about it. We see how Gacy is hooked into the good old boy network of the town, with connections in service organizations, the local alderman’s office, and with long time drinking buddies. We see how he throws lavish block parties to get on the good side of people, and how has made a positive impact on the local establishment through his charity work as a clown. We see glimpses of Gacy’s predatory nature, cruising the streets looking for young men to take advantage of, torture, and murder. We see how he constantly hires young drifters for his contracting business, offering what seems to be a helping hand that in many cases ends up being a ruse to eventually ensnare some of them in one of his lethal traps. We see him brutally hit one of his employees on the head with a hammer, and then back off and beg for forgiveness when the kid recovers consciousness. We see glimpses of how he carries out his evil work, slowly killing his victims and burying their bodies under the house. We see how Gacy gradually starts to fall apart, losing his wife and children when she discovers male magazines, handcuffs and other signs of his secret life. We see how the neighbors and police, alerted by a victim who Gacy let go, begin to get suspicious of all of the strange doings and missing persons that somehow have a connection with Gacy. Again and again the film brings us back to that gross crawl space filled with bugs and worms. Gacy would ensnare young men by offering them work or a place to stay. If it was possible to truly understand and dissect the mind of a madman, a study of John Wayne Gacy could be quite revealing or riveting. But true evil is often very banal and the life of John Wayne Gacy does not fit the profile of the typical Hollywood slasher horror film. The episodic style of this film doesn’t really tell the complete story, and many of the facts and characters were blended together for the sake of simplicity. As a result, we hardly get to know any of the other characters in the film beside Gacy. Other than the brief scene with his father at the beginning, we never get to see or hear about what started Gacy on his road to depravity and what put him over the edge into becoming a serial killer. There would have to be more than just a dysfunctional relationship with his father to account for the despicable acts of his later life. At the same time one can understand how the producers of this film would not want to make Gacy into any kind of protagonist or heroic figure, and why they chose to present information about many of his horrific acts in a low key manner. Yet the character study seems incomplete because the audience never really experiences the side of Gacy that was so successful in business, in making acquaintences, charming two women into marrying him, and being a successful clown. We do sense the alienation that continued to build up in Gacy as the years went by, and how he became more reckless and daring in his predatory behavior. Mark Holton gives a strong and nuanced performance in the title role, but again we are seeing Gacy in his final and declining years. It is ironic that both this film and To Catch a Killer end with detectives and police work solving the crimes, when in reality, Gacy actually began confessing to the crimes early in their investigations. This is another area in the character study that could have used more emphasis. What in the killer’s character finally caused him to snap and confess, then go back into his shell of denial? While this film gives you a sense of the horror and lost purpose of Gacy’s life, and spares you from seeing a lot of the violence that could have been in the picture, ultimately you feel that the portrayal is incomplete. Given the life of Gacy, maybe that’s not a bad thing. 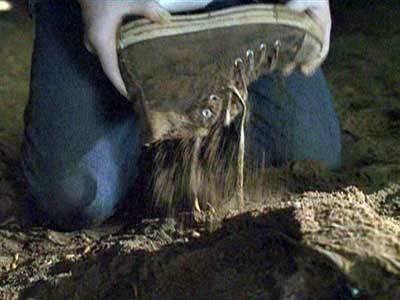 The camera focuses on the shoe of one of Gacy’s victims. 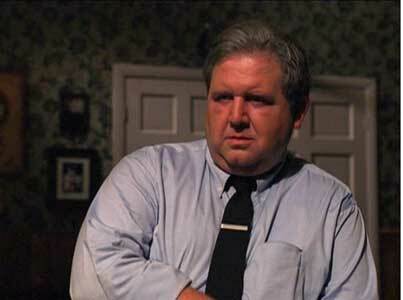 The investigator stumbles onto a gruesome discovery in Gacy’s basement. Black high top chucks have a disturbing presence in Gacy. As his victims were young men and teenaged boys, many of them wore chucks. The camera work in Gacy tends to stay away from scenes of actual violence; instead it will often focus on the aftermath so we see shots of a dead teenager wearing chucks being dragged down the hallway to the crawlspace entrance, or a black high top in the bathroom surrounded by a bloody mess. But the most frightening scene is near the end of the film when an investigator is digging in Gacy’s crawlspace and unearths a black high top buried in the dirt. After pulling out the shoe from the dirt, he drops it in horror as a huge bug crawls out from the remains buried below. After pulling out the shoe of a victim, he drops it in horror as a huge bug crawls out from the remains. Gacy. (2003) Mark Holton, Charlie Weber, Glenn Morshower, Tom Waldman, Allison Lange, Joleen Lutz, Kenny Schwartz, Jeremy Lelliott, Joseph Sikora, Joe Roncetti, Matt Farnsworth, Adam Baldwin, Eddie Adams, Scott Allen Henry, Larry Hankin, Rick Dean. Directed by Clive Saunders.